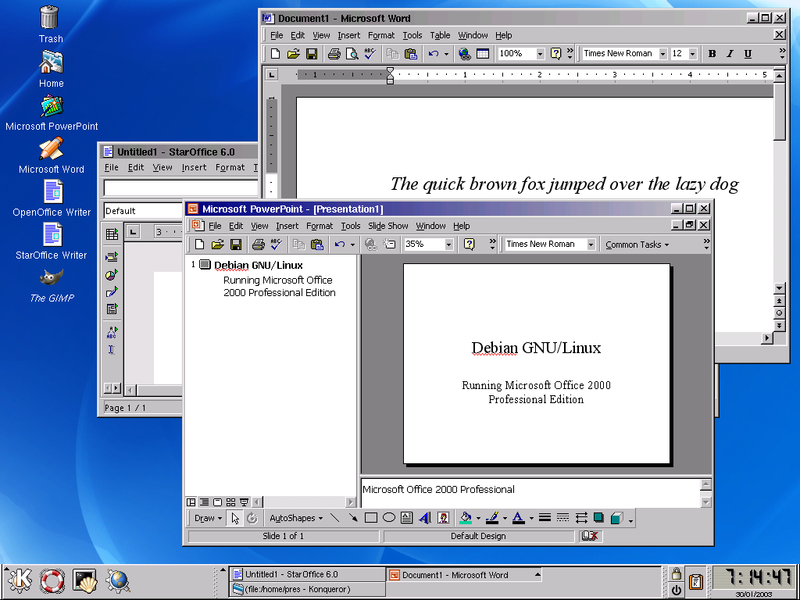 Microsoft alternatives, Free Software and so forth, one cannot resist the temptation to show more twisted things like this shot of Microsoft Word and Microsoft Powerpoint running under WINE within a KDE environment just for fun. Also pictured is Sun Star Office which is being demonstrated along with Open Office. I may eventually produce some (non-Powerpoint!) slides to completement what I will be demonstrating this weekend. For more details on the potential uses of GNU/Linux in education, there are a number of websites online. I would very much like to see Universities such as Nottingham try this Free technology as an alternative or as a step towards removing the Microsoft infection. I met an old friend on Saturday that I have not seen in a while. This reminded me that I am now 21 and am not getting any younger – perhaps it is time to move on with my life, make some changes, and so forth. Dinner in London, very civilised, all things considered. An accident on a Central Line train did not affect us though I expect congestion tomorrow. Tomorrow I am going to visit an interesting company and I need to think about employment or research after graduation, which scarily is going to happen in less than six months from now. I am seriously thinking it might be a good idea to do some further academic study – I feel my undergraduate degree leaves so much undone that there are a number of lose ends…but do I really want to spend the next three years of my life doing something I might well do in my spare time anyway? My passport should be renewed soon and then I think I will have a random weekend break. The trip to California should still be happening though the details have not yet been resolved so it may get pushed back further in to the year. I would really like to line up a few places to visit while over there. Has it really been nearly three years in Nottingham? I pointed out to someone the dangers of allowing untrusted people to load kernel modules through sudo and this spurred me generally in to thinking about kernel code signing. A number of research systems offer the ability to sign code using a simple cryptographic algorithm – it might be useful in Linux but would open a nice little can of worms. I took the new “Understanding The Linux Kernel” book with me on my travels and am enjoying it so far – especially the typeface and typesetting used (Adobe Framemaker and a bunch of Adobe fonts which do look very nice). I should learn the DocBook DTD properly soon and use it for certain documentation. The exam season in Nottingham is now over for me and I am taking a few days reflection while I visit random places and contemplate jobs and so forth. I will be in Cambridge again next month for the Security Seminar (and meet certain friends if they are about) on Quantum Computing. Tomorrow I am in London briefly I believe. I have the new edition of Understanding The Linux Kernel to keep me busy – and am playing with FreeSWAN for a review. Hopefully I will have a SIP/VoIP system in place if I get time next week. I have some proof on concept code for demonstrating some ideas I have been having. Need to go to Birmingham, Oxford, and a few other places too. I just had to wake people up as we could all smell smoke coming from somewhere. Fortunately it appears that it is not coming from our house as we have been around for a smell test. Still, tomorrow the smoke alarms must be tested. If anyone does figure out where the fire is in Dunkirk this evening, let us know. I’m writing a report on Post’s Problem and how it is solved using The Priority Method. While I am not a logician and do not generally persue this area, the course I have been taking in Gems Of Computer Science has reminded me that there is a lot more theoretical stuff out there to understand. I have two more SPARCs coming and I need to talk to those concerned to arrange times to acquire them. I will then have three SPARCstations, one functional IPC and another which needs new fuses. I still need to pick up another two-three SPARCstations before I can get the Amoeba cluster online. I am still sorting out my trip. Hopefully it will be happening in March. I need to meet more people to discuss potential job opportunities and so on. Still thinking about further study but I don’t know where or for whom. I’m up finishing some work I should have done ages ago. Mostly because I have been feeling very strange for the last few days. I think I am starting to feel better now and hopefully can get back in to a normal routine this week. Xbox is surprisingly interesting. I enjoy Splinter Cell very much (and have wasted hours playing it on my housemate’s console machine), Halo and others are so-so. I am not going to become a Microsoft person however I may buy an Xbox for use as a general purpose Linux based Home Entertainment system. It can have IR added, USB devices, Networking, DVD/CDRW modification, and a few other enhancements besides. I went to a Cambridge Security Seminar on NSA Security Enhanced Linux given by Russell Coker. The talk was most interesting and I have decided to play around with a box I set up a while ago for general interest. I do not imagine using it for general purpose computing at the moment. What can be said? This film had all the hallmarkings of a reasonable entree to the Star Trek film collection. Unfortunately it failed to capture that magical feeling one had during some scenes in First Contact or even the occasional bits of Insurrection that I enjoyed. Of course I went to see it – it’s a Star Trek film – I might noy buy this one on DVD for a change.